The full name of Darren Bravo is Darren Michael Bravo. 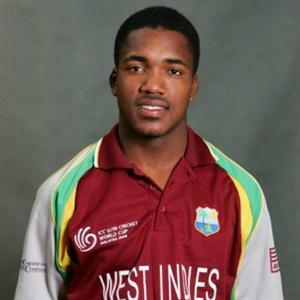 Darren Bravo was born in the year 1989 February 6 at Santa Cruz, Trinidad. The style and shots of Darren Bravo is similar to Brian Lara. the batting record of Lara is also comparable to Lara. Darren Bravo is playing for Trinidad and Tobago as his domestic team. Darren Bravo is a left handed batsman and medium left hand bowler. Even though he had played only few tests and one day, his batting figures were excellent and almost similar to Lara's early career. Darren Bravo made his test debut in the year 2010 15th November against Sri Lanka and his one day debut was against India in June 2009. Darren Bravo made his T20 debut in the year 2010 against Zimbabwe. Bravo played 12 test matches and hit 3 centuries with an average of 47.05. His highest score in test cricket is 195 which was his first century against Bangladesh in the year 2011. His cricket career begins from playing in under 19 cricket for Trinidad and Tobago. Darren Bravo is a strong off side player who has got excellent batting skills and styles similar to Brian Lara. More details about the profile and career performance of Darren Bravo are given below.